and to learn more about the St Sabbas Monastery near Jerusalem. 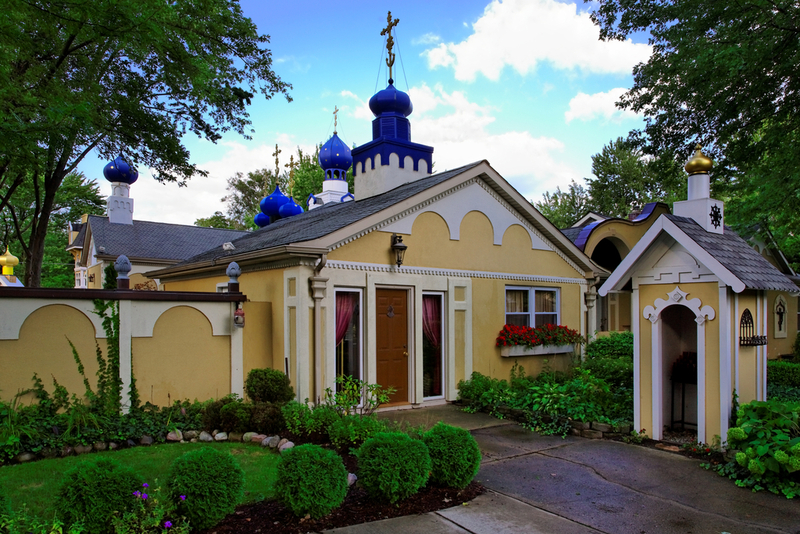 St Sabbas Orthodox Monastery, located in Harper Woods, Michigan, is a monastery of the Russian Orthodox Church Abroad, directly under His Eminence Metropolitan HILARION who is also the Abbot of the monastery. The monastery follows the patristic Julian calendar. The monastery was founded in 1999 as a center for liturgical arts in conjunction with traditional monastic standards. The monastery is presently situated on approximately six acres which includes the Monastery Katholicon, the library of over 6,000 books, the Abbot's quarters, the trapeza, shop and candle making. Ground will soon be broken for the artisans' studios. The monastery is surrounded by beautiful gardens, fountains, and mosaic shrines, very much in the style of the ancient monasteries of Jerusalem, Macedonia, Bulgaria, Greece, Serbia, Russia, Ukraine, Poland, and Romania. St Sabbas Monastery in Harper Woods, Michigan began with the purchase of one property, a lone house as seen above on the left purchased in 1999. This house is currently the monastery library as well as the visiting monastic quarters. Please visit our "Building the Monastery" page to see many "before" and "after" pictures of the amazing 15-year process of building this monastery. Later that same year construction began on the monastery church which has been added on to in stages and still has several phases to go. 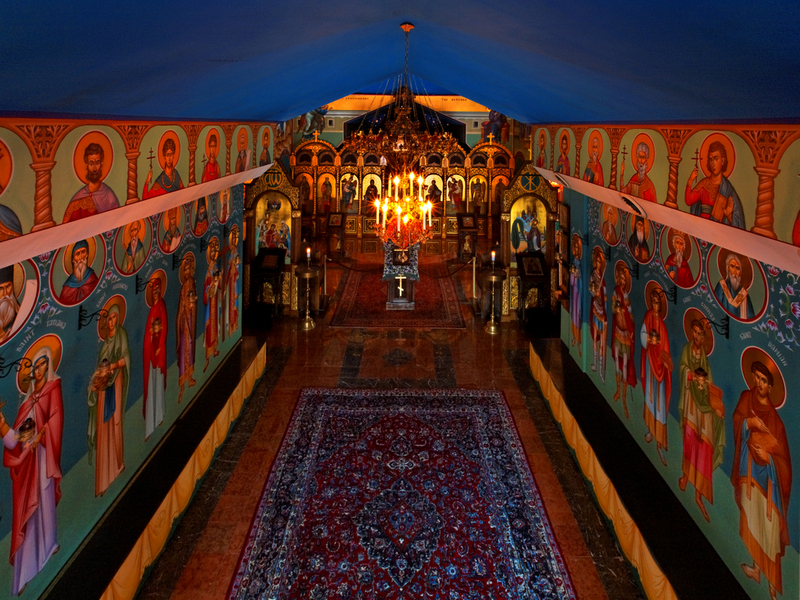 Built and beautified in original authentic iconography with over 30 icons adorning the walls and ceiling, there is not other Katholicon (church) like it anywhere in the world. Where one of the ponds is now, located just north of the church was the motor home where construction workers lived while building the church. The Archimandrite's Cell was the next purchase in the year 2000 which also had a 3-bay motorcycle repair shop out back. The people residing in the house asked the Archimandrite if he'd like to buy the property and he purchased it within two weeks. It now houses the Archimandrite as well as the Royal Eagle Chef. The motorcycle repair shop became what is now the Royal Eagle Restaurant and is the main financial support for the monastery. Renovations for both the Archimandrite's Cell and the Royal Eagle restaurant were generously provided by Steve and Vivian Stoloruk. Renovations were desperately needed as the Archimandrite's Cell had overwhelming damage to walls, and there was often three feet of standing water in the basement. In 2004 a home three doors down from the monastery was purchased to be a guest house and currently houses the nuns from the monastery. In 2005/06 another home was purchased next door but was lost during the housing market plummet, but was again acquired in 2012 and houses monastics attached to the monastery. An additional house was purchased two doors down from the monastery in 2011 and is now where more monastics live and also contains the monastery candle-making workshop. St Sabbas Monastery has an epitrachelion (stole) that was removed from the body of St Sabbas at his monastery near Jerusalem and given to Archimandrite Pachomy in 2012. Additionally, St Sabbas Monastery has the Skufia of St John the Hozevite (born 1913 A.D.) as seen in this picture, given to Archimandrite Pachomy in 2012 from the Abbot at St George the Hozevite Monastery in the Waddikelt desert region. St John Joseph was a Romanian cave-dweller and a wonder-worker and was also a monk at St Sabbas the Sanctified Monstery near Jerusalem. Both relics are kept in the monastery church for monks and lay-people to venerate. Archimandrite Pachomy is the Administrator of St Sabbas Monastery. His training began at Oakland University while studying Slavic studies under the tutoring of Mrs Helen Kovach-Tarakanova. Helen Giorgivna was a great inspiration and a prominent personality within the Russian community. She and her son George, also a friend of the monastery, lived with and were friends of the last Russian Duchess, OLGA ALEXANDROVNA, sister to TSAR NICHOLAS II. From there his studies took him to St Tikhons Orthodox Theological Seminary in South Canaan Pennsylvania where he became a novice in the oldest American Orthodox Monastery in America. Graduated in 1988, he was ordained to the Priesthood and served as priest at the Macedonian-Bulgarian Orthodox Church in Lorain, Ohio. From there he was given the position as priest in charge of All Saints Russian Orthodox Cathedral in Detroit, Michigan. Defending the Patristic calendar of the church, he was received into the Russian Church Abroad under Metropolitan Vitaly and blessed to build a Monastery in Mid-West America. Archimandrite Pachomy was Rasaphored in 1992 and tonsured in 1996. Raised to the rank of Igumen at the hand of Metropolitan JOSEPH in 2003 and elevated to Archimandrite in 2006. The Monastery of St Sabbas has many ties to various Monastic communities of Russia and visitors from respected monastic communities visit yearly. The monastery also is blessed to have brotherly ties with St. Sabbas the Sanctified in the Judean Desert under the Jerusalem Patriarchate, His Holiness Patriarch Theophilous, Abbot Archimandrite Evdokimos, St George the Chezibite in the Judean Desert under Archimandrite Constantinos, monastics of the Russian Orthodox Church Outside Russia, the Serbian Orthodox Church, the Romanian Orthodox Church, the Greek Orthodox Church and the Ukranian Orthodox Church Moscow Patriarchate.